Khaled Irizary is a typical university student: he is 20 years old and about five foot eight. He’s a jokester, but he has a friendly demeanor. He likes to play sports, go to parties, and go out with his friends. He gets good grades and respects his Puerto Rican parents. Apart from his height, he doesn’t stand out from a group of typical adolescents. Still, there are certain parts of his life and daily routine that are different from that of his friends or their parents. For one thing, he doesn’t drink alcohol. In addition, he doesn’t eat pork. This is because Khaled, just like a growing number of Hispanic people in New York, has converted to Islam. He converted with his parents. His story is one that he shares with many other people, people with Hispanic roots who have embarked on a unique journey. It is estimated that between 100,000 and 200,000 Hispanic Muslims live in the United States. This is a small percentage of the approximately 3 million Muslims in the U.S. However, this number is growing. More and more Hispanic people are embracing Islam. As a result, they have formed a series of organizations to support conversion. One of them, Latino Dawah, is an online organization for Hispanic Muslims that publishes articles about Islam, stories that discuss and respond to issues that the Hispanic Muslim community faces. My cousin married a Puerto Rican man, Tomás Hamza Rosa, who had converted to Islam before he met her. I consider him my brother-in-law. I was born Muslim in a Bangladeshi family. I have lived a very different life compared to my Puerto Rican brother-in-law. I have friends of family of Hispanic descent that converted to Islam just like him. Every one of them gives me a perspective on their styles of life and how their life changed as a result of converting. All of them, including my brother-in-law, were Catholics before they converted. They felt lost and found Islam in different ways. Many of them found it through their friends. Others had to go on a spiritual journey alone, searching through books and the Internet to find someone that presented the faith to them. It was difficult for them to be accepted by their friends and family because of their new religion. As for me, I never had to face the difficult task of telling my parents that I converted, or go through the number of hardships that followed. I never felt alone because I grew up in a Muslim family. I never had to experience a serious confrontation between my religion and my culture. I never had to go through the pain of feeling lost because I felt I was missing something spiritually. My brother-in-law Tomás was raised in a strict catholic home. His parents were surprised as the beginning about his conversion to Islam, but later they accepted him. Khaled tells me that it was at a time when his family was going through several hardships that he found Islam through a friend. He began to follow the teachings of Islam and he felt less stressed and more spiritual. His parents felt the same way and they converted with him. My brother-in-law and I remember his wedding. He married my cousin in a beautiful wedding venue in New Jersey. 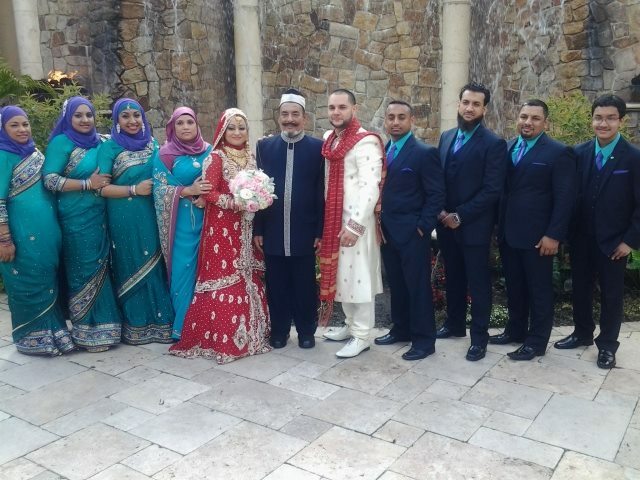 The wedding was a unique combination of the religion and the Bangladeshi and Puerto Rican cultures when everyone that was invited came together. While his family arrived in their finest clothes (typical for a Puerto Rican celebration), the women on his bride’s side wore traditional Bangladeshi clothes. The sisters and aunts of the bride wore colorful dresses and hijabs, while I, along with the bride’s brothers, wore brand name suits. The bride and groom wore garments traditional to Islamic weddings. There was food from both cultures at the wedding, but all of it was halal. (Muslims eat food that is considered halal, or edible under certain Islamic teachings). So, there wasn’t any pork or alcohol. Because I was born in a Muslim family, I never realized just how important of a decision it is to convert to a new religion. I was impressed by the unity and passion between my Hispanic friends and family that had converted. I feel that talking with them has enhanced my own faith. Like my friend Amir Rodriguez, another Hispanic convert, says: “you find happiness when you look for it within yourself, not in others”. *Hanif Ahmed is a first year student in the university program at Bard High School Early College in Queens, NY.